This is the second in a series of blogs comparing the New York State and Californian energy and regulatory policies. 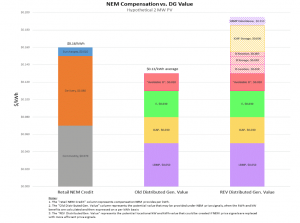 IGov is uploading a series of blogs over the coming week to compare New York State (NYS) energy governance with Californian (CA) energy governance. The first blog provides an introduction to the series. This 2nd blog is an update of the New York State Reforming the Energy Vision (NY REV). IGov has previously written three blogs about the NY REV: 2014, 2015 and 2016. The 3rd blog sets out Californian energy and regulatory policy. The 4th blog compares the fundamental principles and characteristics of NYS and CA regulatory policy. The 5th blog is a more detailed comparison of CA and NYS policies towards DER, and the 6th blog reviews the potentially different distribution utility functions and names. IGov has previously written three, general blogs about the NY REV: 2014, 2015 and 2016. Please do read those blogs along with this blog, because this blog will only provide a very limited precis of that information. The NY REV was kicked off in April 2014, with a February 2015 Vision Order from the PSc (see here). The 2015 Vision / Order envisages an evolutionary rather than revolutionary transition. The February2015 Order required the delivery of Market Design and Platform Technology Report (MDPT). The MDPT set out ‘an end point’ of where it expects the NY REV to get to after about 10 years (or the mid 2020’s), see Figure 1 below. This end-point is a smart, primarily decentralised, market / platform-based transactive energy system with a new basis of regulation; new institutions; new roles of central actors; and new ways of making money. The MDPT also set in train numerous working groups about the various issues of transforming the NYS energy system, and reports from those working groups are now (2017) being published. Figure 1 The timeline for NY REV change (MDPT). On 19 May 2016, a White Paper on Ratemaking (two years after the NY REV kick-off) was published which sets out the different ways that utilities will be expected to make money in the distribution system provider (DSP) future, and the timelines for doing so. In general, the Ratemaking Order made less difference to utility revenue over the next 3 years than might have been expected from the rhetoric of the 2014 Vision . However, it did show that the way of regulating utilities and the revenue base of the utility is expected to fundamentally change over time; and provided a means to link the revenue base of utilities with the wider NY State energy program (see here). For a power point slide deck which provides more detail of this, please see here, and Figure 2 below. The Ratemaking Order (here and here) represents a new balance of regulation and markets for the distribution utilities where the respective role of regulation and markets is (1) a continuation of the usual: money will continue to be made through traditional cost of service; (2) a new bringing together of regulated performance incentives mechanisms to fulfil Government policies through Earning Adjustment Mechanisms (EAMs) – by helping to enable public policies and goals are delivered (for example, the renewable energy or energy efficiency programs) ; and (3) a new source of revenue from platform service revenues (PSRs), which are linked to the developing transactive energy markets. Please see Figure 2 below. It is this triad of revenue streams which is so unusual about the New York model. Figure 2 is my own creation from what is said within the Ratemaking Order, because no ‘formal’ figure like it exists. The time horizon is left deliberately vague but roughly 10-20 years. 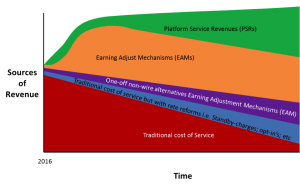 Traditional cost of service appears to reduce rapidly but this may well not be the case. Similarly, EAMs are expected to reduce as PSRs pick up, but again this also may not occur. The key point to take away from this figure is that the PSC wants to move regulation from traditional cost of service to include more performance based regulation directly linked to required outputs. The actual numbers and timescale are very much open to discussion. Markets are central to this new Vision. Innovative, local markets / platforms and ways to operate the energy system are already being stimulated in NYS. For example, there is a transactive power proposition developing in the Gowanys Slope and Canal area of NYC – where LO3 (a platform company) is developing the means for neighbours to sell their excess solar power to each other (see here). No money is changing hands yet, but in a ‘working’ situation, under the new ratemaking rules, the DSP would make money from incentivizing those transactions. However, whilst markets are central, so is regulation. As described in Blog 1, The NY REV built on their legal mandate that distribution utilities would continue with their public service requirement. The NY REV therefore is an experiment in facing the new utility challenges, including (1) the increasingly serious issues of how to pay for networks given changing technologies and means of provision, combined with (2) traditional concerns of ensuring vulnerable customers remain able to access affordable energy – whilst (3) at the same time trying to encourage innovation and new behaviours via markets. Up until this point, the blog has been briefly recapping information provided in previous NY REV blogs. From now on, this is new information. Following consultation, a March 2017 PSC Order was published, with three dockets from the PSC: (1) an introduction to the Value of Distributed Energy Resources, (2) Distributed System Implementation Plans, and (3) the Interconnection Earnings Adjustment Mechanisms. All of these Orders are more detailed workings of previous more generally stated agreements, and will be central to how different entities, including distribution utilities, can make money. The NY REV argues for a new value proposition or function, the ‘heart’ of the newly envisioned NYS energy system – a distributed system provider (DSP). Originally, in the 2014 Vision, the PSC talked about as a distributed system platform provider (DSPP). This was trying to make clear that a platform function was being added to the distribution utility. However, it became agreed that DSPP was too unwieldy and it was changed to DSP. The idea of a DSP is transformational in the sense that it is a new function able to coordinate system operation and markets within their areas, whilst at the same time working towards meeting State policy goals. The idea of the DSP is that the utility is to be regulated in such a way that it incentivizes new behaviors (i.e. 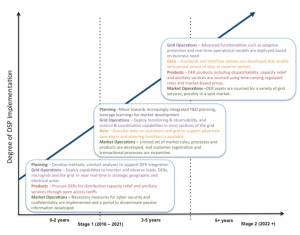 the DSP function), including with its customers and its service providers, turning the current ‘passive’ distribution utilities into ‘active’ market facilitators and system coordinators. At the same time, the public service obligation remains with the distribution utilities. In this way, the NY REV is attempting to marry traditional regulatory requirements (cost of service and public service obligations), new types of regulation (performance based regulation) and new market behaviours (customer focus, service orientated, transactive energy). It is this effort towards this new triad of interlinked goals which makes NYS so interesting. This is discussed in more detail in Blog 5 of the series, and a slide set of can be found here. Much has been written about NYS and the NY REV. We would argue that it is important to separate out the changes on the ground from the underlying principles and ideas of the NY REV. The latter are transformational because of the new distribution value proposition and DSP function, which we would argue is in keeping with the needs of D4. The actual situation is NYS is a fascinating laboratory or test-bed of the issues raised when trying to transform an energy system. Other countries may or may not follow the NY REV exactly, but it is clear that many of the ideas put forward within the NY REV regulatory reform will become seen as the norm and be rolled out around the world. This is discussed further in Blog 3 of the series – the comparison of the NYS regulatory system with that of California. The EAMs should not add more than 2% of their delivered revenues to the distribution companies in the first phase (ie over the next 3 years). Given that current performance based regulation is related to slightly less than 6% of total delivered revenues in NY, this takes PBR up to about 8%, which is a small change.